Can We Get A Hat-Trick Of Wins? After that ten-day break after our home win against West Ham, now we will have had two games in the space of three days. First that 4-0 second half thrashing of a strong Chelsea side at Dean Court on Wednesday night. With two home wins and clean sheets on the trot at Dean Court against the two London clubs, the Cherries need to maintain this form and get back to winning ways away from home. Cardiff City (the Bluebirds) is our next game. This will be Cardiff’s first home game since the news of the disappearance of the plane carrying their new player and the pilot which has been well documented. It will be an emotional event with a late afternoon start. This will be the Cherries first visit to the Cardiff City Stadium since our promotion season from the Championship. The stadium was built on the old Cardiff Athletic Stadium, (thinks, maybe, just maybe, Kings Park one day). Their stadium is just over a mile away from their old ground Ninian Park. The name “Bluebirds” originated from a 1909 children’s play by Belgian Maurice Maeterlinck, brought to New Theatre, Cardiff in October 1911. So enthused by it by one Cardiff City supporter that when the club changed from their chocolate and amber strip to blue, the club coined the nickname ”The Bluebirds”. Following Cardiff’s 2-0 defeat at Dean Court, they kept clean sheets in the following two games of August. In the opening home game of their return to the Premier League, they drew 0-0 with Newcastle United, following this with the same result up in Huddersfield. September was to prove to be a bad month for the Bluebirds, losing all four matches. Three of the fixtures were against top six sides. Two from London to start with, losing at home against Arsenal 2-3 and then away to Chelsea 4-1. Then it was back home to face last season title winners Manchester City, Cardiff were thrashed 0-5. Last game of the month was home as well against Burnley, it finished 1-2. October’s three games included another two top six sides. First Cardiff travelled to Wembley Stadium to face Spurs, they lost by the only goal of the game. The next game at home brought smiles at last to the Cardiff City fans as they gained their first win of the season so far, beating Fulham 4-2. The jubilation was short lived as their next game was away against Liverpool, it ended with a 4-1 win for the Merseysiders. November had Cardiff playing at home three times out of the four games played. They started the month at home against Leicester City, losing by 0-1. The next home game was a 2-1 win against Brighton. It was another trip for Cardiff up to Merseyside, this time to face Everton, the home side were the winners with the only goal of the game. The first game of the month was at home and another win for Cardiff, beating Wolves 2-1. December had a busy six-game schedule for the Welsh club, first visiting the London Stadium where they were beaten 3-1 by West Ham. Back home and another win for Cardiff beating Southampton 2-1. Next was a trip to play Watford, the home side taking all three points in a 3-2 win. Back home again and the visitors were Manchester United, they repeated what their neighbour’s City did by putting 5 goals in the Cardiff net, only this time Cardiff scored to make it 1-5. The next two games were away, first a 0-0 draw at Crystal Palace, then the last game of the month and year followed by Cardiff City’s first away win of the season 0-1. The first game of 2019 was at home to Spurs, the London club taking all three points in a 0-3 win. The second game of the new year was again at home, it ended in a 0-0 draw with Huddersfield Town. The next game was away against Newcastle United, it ended with a 3-0 home win. Cardiff’s most recent game was on Tuesday night away to Arsenal, they lost by 2-1. Cardiff had 19 shots on goal, but only 2 were on target. Arsenal had 15 shots of which 4 were on target. Neil Warnock described his team’s performance as the best so far this season. Our only game so far against Cardiff City in the Premier League was the first game of the season at Dean Court, it finished with a Cherries 2-0 win. The last time we played Cardiff City on their ground was in the Championship and the game finished in a 1-1 draw. In all league games away to Cardiff City, the Cherries have W 2, D 6, L 8. In all competitions, the Cherries have W 18, D 11, L 13. Sean Morrison has been out after having an appendicitis operation. Otherwise, they have a full squad to pick from apart from Harry Arter who is on loan from AFCB and unable to play against his own club. Oumar Niasse has been signed on loan from Everton. Oumar Niasse on loan from Everton had a good game against Arsenal. Aron Gunnarsson, Joe Bennett and Callum Patterson also ones to watch. Callum Wilson out after having a minor operation on his knee. Jefferson Lerma ankle injury. 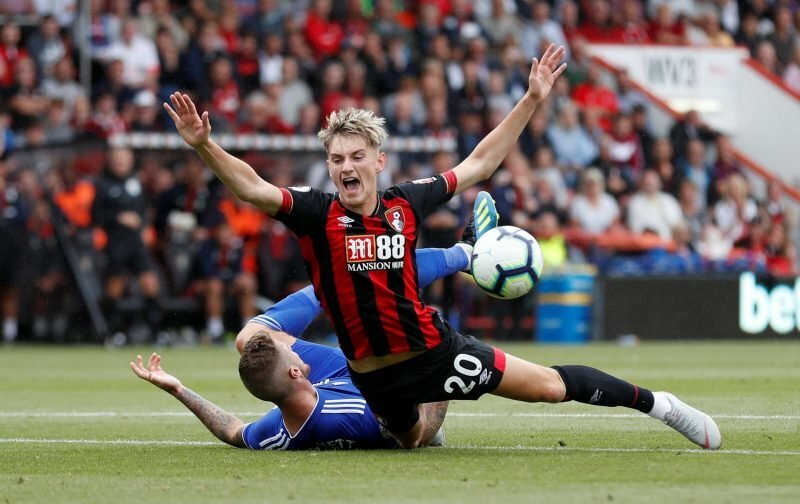 David Brooks went off with a knock in the second half against Chelsea. After watching Chelsea, it’s not about one player but the team. Can Josh King continue where he let off at Dean Court with his brace against Chelsea, this time on away soil. Maybe Solanke will get his debut if Brooks isn’t fit. If Lerma can come in it’ll allow midfield to step up and play higher than it did against Chelsea. There will be some knackered legs to manage. Wee Man, Brooks, Smith all put in big shifts. Stanislas and King returning to some form is very timely. – Join the conversation, click here.